In stock 153 items in stock. 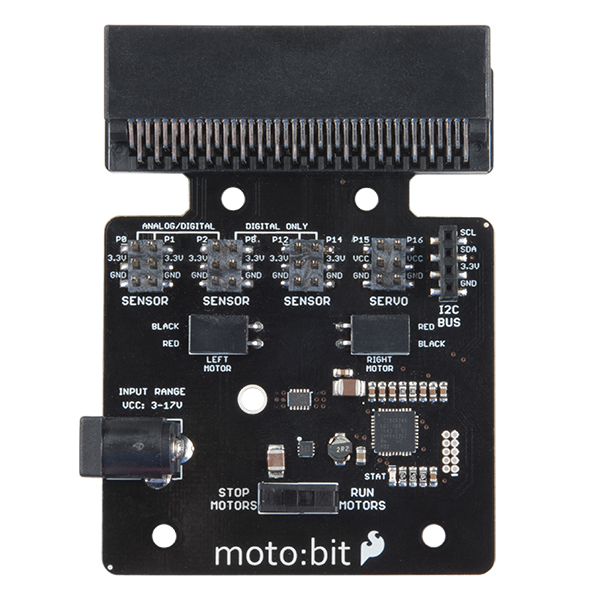 The SparkFun moto:bit is a fully loaded "carrier" board for the micro:bit that, when combined with the micro:bit, provides you with a fully functional robotics platform. 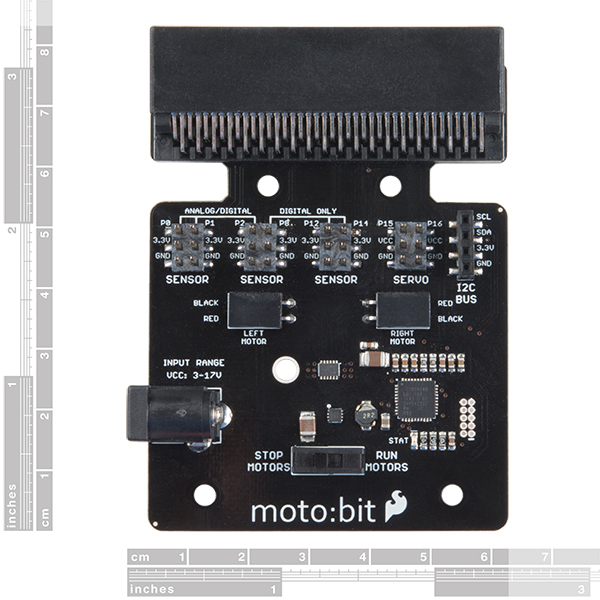 The moto:bit offers a simple, beginner-friendly robotics controller capable of operating a basic robotics chassis. 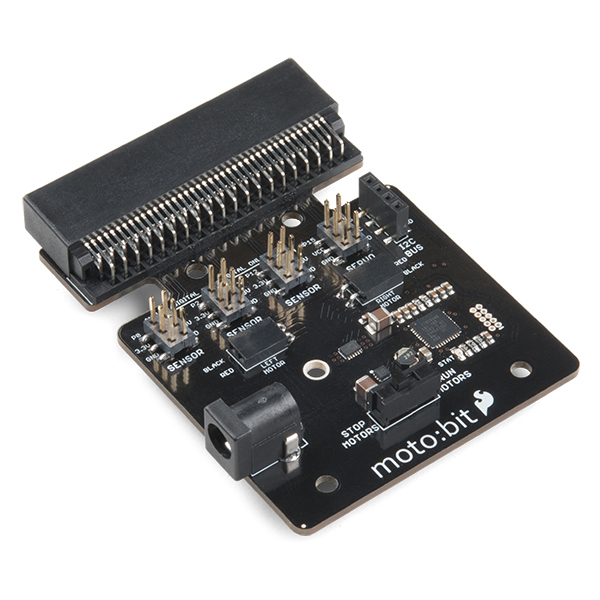 Onboard each moto:bit are multiple I/O pins capable of hooking up servos, sensors and other circuits. 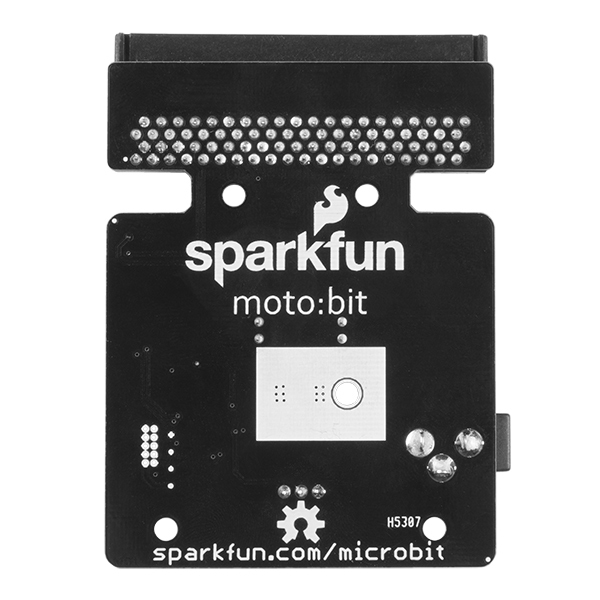 At the flip of the switch you can get your micro:bit moving! Important: The silkscreen indicates an input voltage range of 3V to 17V but we have found that the actual range is 3V to 11V. Please do not apply more than 11V to the power jack on the moto:bit. We are currently updating our boards to resolve this issue. The red blinking LED means that the moto:bit is alive and ready. It is not a problem status indicator LED. I see there is an input voltage range of 3-17v. Does the input voltage carry through to the voltage supplied to the motors? Right now all I have is 4 x aa battery holder and I was wondering if I purchase something like 3c lipo at ~11v would that extra voltage get regulated down or would it carry through to the motors and allow them to spin faster. I looked thought he docs and did not see anything about the output voltage so I apologize if I missed it. Thanks! This motor driver plus additional sensor/servo breakout is a welcomed addition to my Micro:Bit projects. Some things I really like about the board is the power switch and barrel jack (perfect for 9v, AAA, AA battery packs; max 17v). I would like to see the spring loaded pin connectors for the motors, that would allow for various size wiring and provide a tight hold onto the wires, but this is still a very solid product. I will recommend to others. This makes using motors and sensors in unison easier than most other breakout boards. 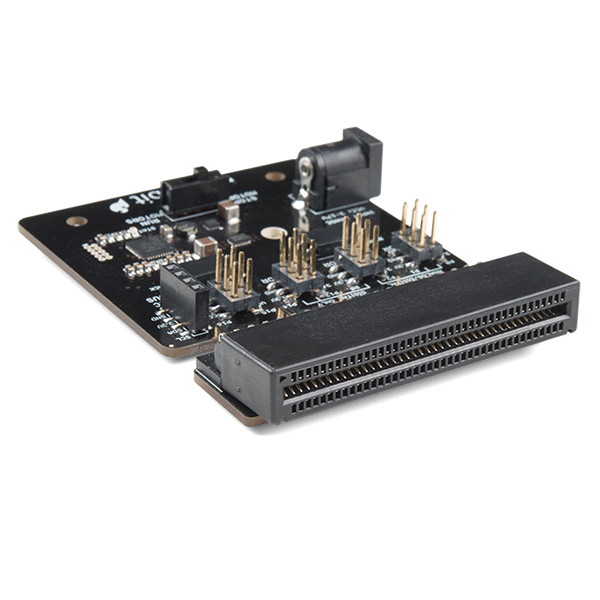 I would like to have a 90 degree version (with the microbit mounted vertically to the horizontal moto:bit board) to make it easier to place on smaller robots. Other than that it works great! This takes a LOT of the hookup trouble out of the equation in making a functioning robot ready for prime time! Love it and have gotten several kids hooked on making things that move!